The walk into Joffre Gorge is a must if you’re in the area. It’s so close to the Eco Retreat that you can easily walk here in ten to fifteen minutes. 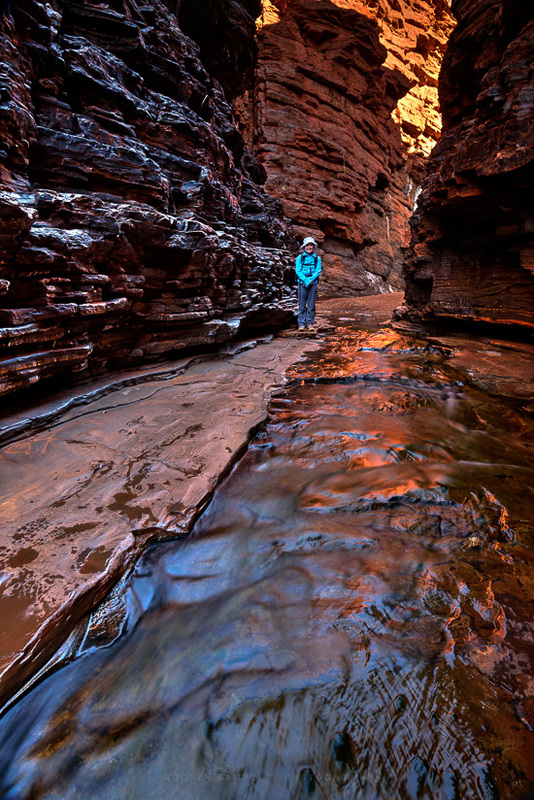 In the late afternoon the sun gets low and reflects off the red rock walls and reflects an intensely golden light into the darker interior of the gorge. On these hot days (even during the winter dry season the temperature during the day is easily 30˚ celcius) it’s much better to be in the gorges at the edges of the day. Early morning or late afternoon is the optimal time as the cooler shaded gorges offer an escape from the heat of the day. During the middle of the day however when the sun is high in the sky the gorges are lit from above and there’s no escape from the merciless sun. 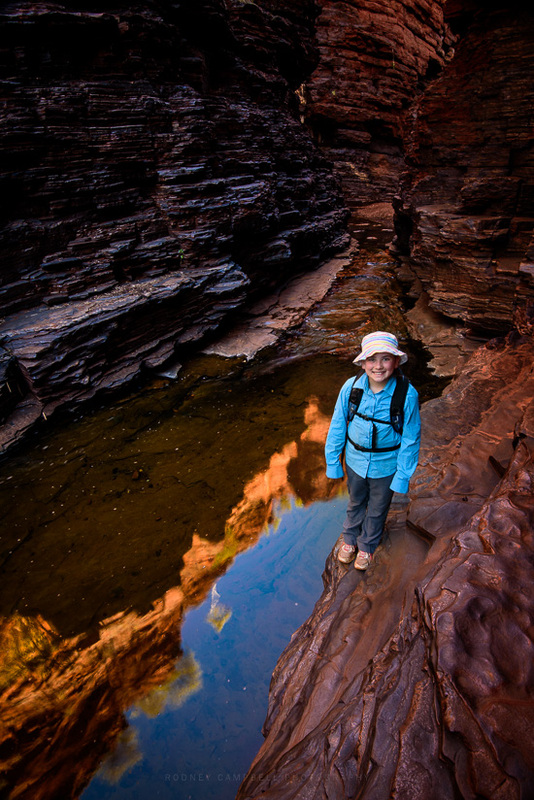 Just before 4PM my daughter and I make it down to the last few ledges before reaching the bottom of the gorge. As it happens this is also the ideal time for photographers as well. Flat direct light in the middle of the day is not your best friend. When the bottom of the gorges are in shadow but lit by light reflected off the sides of the upper gorge walls is perfect. At the bottom of the gorge if you turn right there’s just a short walk through this section before it opens up to the main attraction. This spectacular curved waterfall forming a natural amphitheatre. 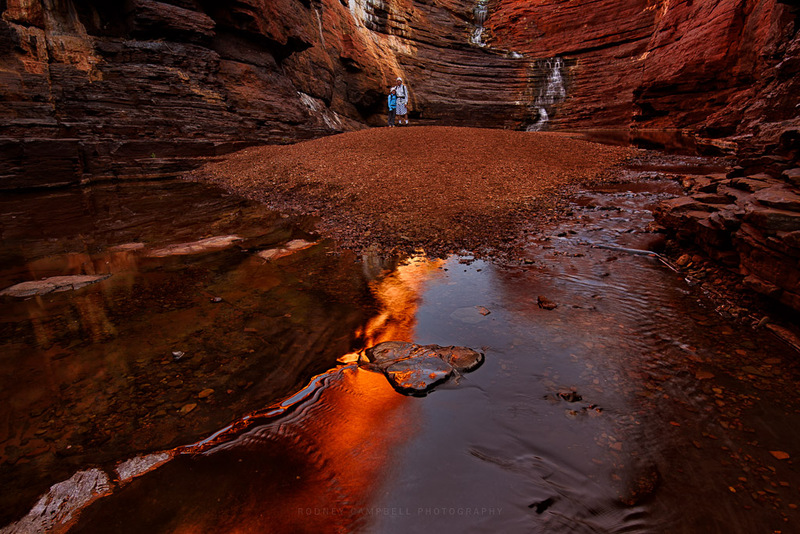 Joffre Falls is the highest waterfall in Karijini National Park and there is a large plunge pool at the base. Above my daughter and I pose for a quick selfie inside this natural amphitheatre, the lower part of Joffre Falls behind us.